EXPERIENCE INDOOR GOLF AT STONEBRIDGE! Choose from dozens of championship virtual golf courses or use the indoor driving range and practice facility feature to drive, chip and put indoors. 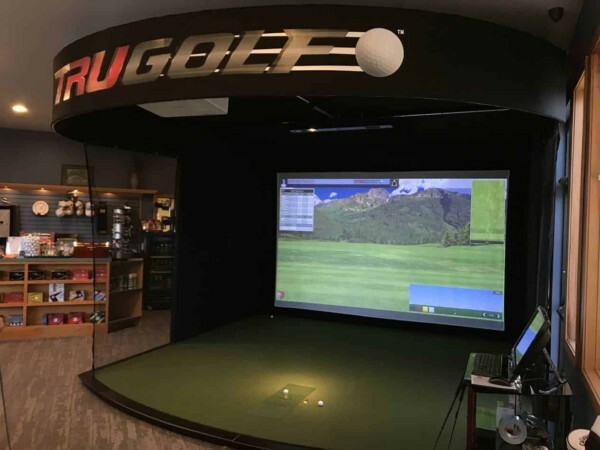 Our state of the art HD TRUGOLF indoor simulator offers swing analysis after every stroke. Full Bar Service & Snacks while you play! WHY CHOOSE STONEBRIDGE VIRTUAL GOLF ? The Stonebridge virtual golf simulator offers the very newest in tracking technology for a true tee-to-green experience. Virtual golf courses are displayed on our high definition 1080p laser projector for the most realistic indoor golf simulation in Ann Arbor. The new industry standard offering the most realistic golf simulation experience…Stonebridge has it! Cutting-edge hardware and software for a complete golf simulation experience, tee-to-green… Stonebridge has it! Full Swing Analysis technology…Stonebridge has it! WHERE WILL YOU PLAY GOLF TODAY? Choose from over 80 Championship Golf Courses around the world!